Stretching after exercise—we all know we should do it, but do we all actually know how? Stretching after a workout is a great way to release tightness within your muscles, lessening stiffness the day after and potentially preventing injury. However, with the choice of hundreds of stretches, it can be tricky knowing where to start. Today we explore stretching routines suited to some common types of exercise, and the correct techniques you need to know. Power walking and running can be taxing on our lower bodies, with thighs, calves and hamstrings all tightening up as we pound the pavement. Release that tension straight after your session by attempting these simple leg stretches—just ensure you’re on a flat surface before you start. Quad stretch: Standing with your feet slightly apart, lift one foot up behind you so it’s hitting your bottom (use a nearby wall or chair for balance if you need to). Use one or both hands to hold your foot in place, gently pulling it in towards you to increase the stretch. Hold for 15 seconds, then repeat on the other side. Calf stretch: Stand with one foot forward, one foot back, both sets of toes facing straight ahead. Keeping your back leg straight and front leg slightly bent at the knee, gently lean into the stretch (making sure your knee does not bend further than your toes, which can cause strain). Hold for 15 seconds, then switch sides. Hamstring stretch: Position one foot slightly forward, the other placed naturally below you. Lean your front foot up onto its heel, your toes pointing straight up towards the sky, and bend forward into the stretch (placing your hands on your hips will assist with balance). Hold for 15 seconds then repeat on the other leg. If you’ve just completed a high intensity round in the backyard on your Vuly trampoline, then these stretches will provide the perfect warm down. We recommend completing a relaxed three minute bounce before stretching to first lower your heart rate. Ankle stretch: Sit on the ground with your legs straight out in front of you. Begin by pointing your toes, then releasing them, repeating 15 times. Then complete 15 small ankle circles, keeping your toes pointed for the duration. Lower back stretch: Lie flat on the ground with your legs out in front of you. Keeping your back flat, lift one leg up towards your chest, gently pulling your thigh in towards you. Hold for 15 seconds, then slowly release your leg back onto the ground. Repeat on the other side. Stretching is valuable after any kinds of weight training, which can result in muscle spasm and stiffness. These specially formulated upper body stretches will be most effective right after your exercise while your muscles are still warmed up. Side bend: Stand shoulder-width apart. Raise both arms above your head, then bend your elbows, with your left hand gripping your right elbow and your right hand falling behind you. Gently bend towards the left, your hand lightly pulling your elbow to increase the stretch. Hold for 15 seconds, release, and repeat on the opposite side. Shoulder stretch: Stand shoulder width apart, clasping both hands behind your back. Lift your hands up towards the sky so your arms are extended out behind you. Hold for 15 seconds then release. Upper arm stretch: Standing neutrally, raise your right arm straight out in front of you, then in across your chest. Bend your left arm at the elbow and use it as an anchor to gently pull your straightened right arm in towards your body. Hold for 15 seconds then repeat on the opposite side. 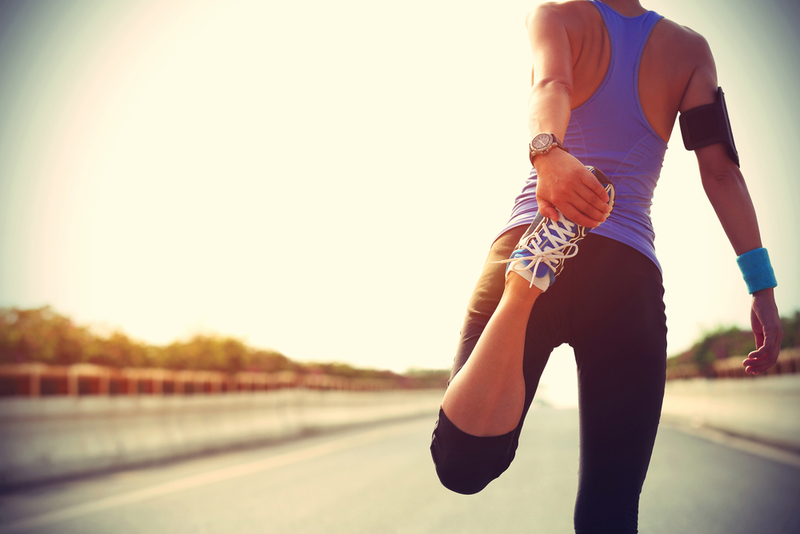 Have you recently incorporated stretching into your exercise routine? Let us know how you feel after completing a stretch session!